The Saint Pope John XXIII (Latin: Ioannes PP. XXIII; Italian: Giovanni XXIII), born Angelo Giuseppe Roncalli (25 November 1881-3 June 1963), was an Italian priest of the Roman Catholic Church and the 262nd Pope from 1958 to 1963. Roncalli was born in Sotto il Monte Giovanni XXIII in northern Italy. In 1904 he was ordained as a priest in a Roman Church of Santa Maria. Later in 1905, the new Bishop of Bergamo, Giacomo Maria Radini Tedeschi, appointed Angelo his secretary. Angelo went with Bishop Giacomo to all his pastoral visits. Angelo also helped him with many other tasks like managing the diocesan bulletin, going on pilgrimages, and social works. Angelo did even more work in the seminary using his very good preaching skills he taught history, patrology and apologetics. It was in the seminary he met the two future saints that would affect his life dramatically. These two Saints were St. Charles Borromeo and St. Francis de Sales, who were both very good pastors in the same seminary, and had a kind of apprentice like relationship. Father Angelo was extremely devoted to Bishop Giacomo until his death in 1914. After Bishop Giacomo’s death, Father Angelo continued teaching in the seminary, but was dragged into World War I and served as a medical corps sergeant and after the war started Italy’s first home for poor young students. His life after the war started changing dramatically, and he even got the attention of Pope Pius XI. From 1925 to 1944, Roncalli was a papal representative in the Balkans and the Mideast. Roncalli was Patriarch of Venice from 1953 to 1958. Venice is the see of a cardinal. Cardinal Roncalli was elected pope on October 29, 1958. His coronation was televised in Europe, and filmed for viewing in other parts of the world. Pope John expanded the College of Cardinals by naming the first African Cardinal, the first Japanese Cardinal, the first Filipino Cardinal. and the first Venezuelan Cardinal. He was the first Pope to make an official visit to the President of the Italian Republic at the Quirinal Palace. 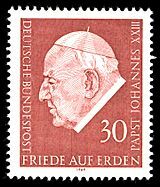 Pope John brought together the church's bishops and cardinals in a meeting called Vatican Council II. It was ended by the Pope's death. John XXIII is buried with other popes in a crypt below St. Peter's Bascilica. According to the official news agency of the Soviet Union, the pope's reign "was marked by fruitful activity for the sake of consolidating peace and peaceful cooperation among nations." 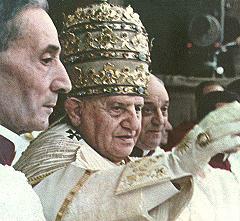 On September 3, 2000, Pope John XXIII was beatified and given the title of "Blessed John XXIII". On April 27, 2014, Pope John XXIII was canonized by Pope Francis and declared the New Saint of the Catholic Church given the title of "Saint John XXIII" alongside Pope John Paul II now known as "Saint John Paul II". Pope John XXIII Facts for Kids. Kiddle Encyclopedia.